This section gives some quick health indicators about how much FAmSCo is communicating. Sometimes FAmSCo members can't make a meeting due to travel or conflict, but the combination of meeting attendance plus email is a nice metric. As of the time this report was prepared, 5 regional meetings held in January had been logged. NA -- 2 meetings, both attended by David. EMEA -- 2 meetings, both attended by Max, 1 attended by Luca and Joerg. APAC -- 1 meeting, attended by Susmit. LATAM -- no meetings logged. IOTA is selling pressed Fedora DVD from their stall at Kolkata Book Fair. FAmSCo has ensured that trademark guidelines are followed by answering any questions and pointing to resources needed. zyxware.com became a Fedora vendor. Significant work was done to clean up all FAmSCo wiki pages at the start of the new year, and new FAmSCo term. Clarified the primary tasks and goals of FAmSCo in 2010. Created a new FAmSCo mailing list with open archives. Revised and ratified the FAmSCo election rules. An Ambassador training class was held in Fedora Classroom. The Events FAD 2010 was held, and a tremendous amount of work that is valuable to Ambassadors and regions around the world was started. See the following event reports for more information. In addition to the main FAD page, please see Max's wrapup post. We are currently in Q4 2010 (December 2009 - February 2010). FAmSCo's total budget for this quarter is $32,000. At the current pace, we are going to finish the quarter well under budget. This is fine if there are no urgent needs worldwide, but it seems like the flow of money into the regions that need it is currently stalled. In short, FAmSCo is worried about what seems to be very little spending in LATAM, India, and APAC. We still have about two weeks left in this quarter to correct that, but it requires those regions to get their shopping lists together quickly. In your regional meetings, please make a list of the things that you need, and bring that discussion to the mailing list. 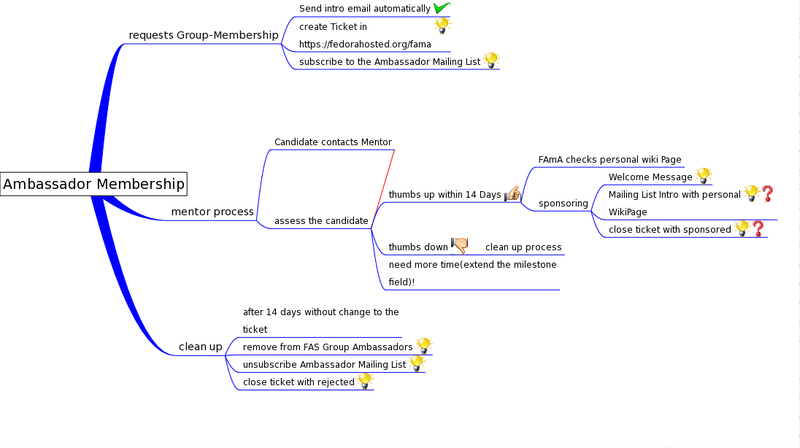 One of the items on the FAmSCo agenda regarding mentoring is the automation of the membership service, which will improve the mentoring workflow, as described here. Case badges (for the WORLD) were ordered and received. First 2010 ambassadors requests and Brazilian freemedia requests were shipped in Brazil. FUDCon Santiago is announced, and in planning. An initial meeting was held with ambassadors from Chile to define tasks and roles. Plans to build a strong Fedora community in Uruguay has been started. First event in Uruguay with Fedora participation is in planning. 2 new people from Uruguay were invited to join and build the local community as Ambassadors. Brazilian Fedora community announced new project leaders  , and starts to plan actions for 2010 . FISL 2010 is announced and in planning. FOSDEM 2010 is the main event in EMEA for Q4 (December - February). We will hold a Fedora Activity Day on February 5th, and FOSDEM itself is on February 6 & 7. New Fedora poloshirts are ordered and will arrive February 4, in time for FOSDEM. 41 listed Fedora contributors will attend FOSDEM. Christoph Wickert and Michael Spahn will attend LIT-OL in Oldenburg, where they will present Fedora. Christoph will also give a talk about Fedora. We have new swag for the EMEA region, and the EMEA swag inventory has been updated. Inactive Ambassadors in India will be purged. The regional coordinators sent repeated mails asking Ambassadors to participate, and the mails that either bounced, or never received replies, will be purged. India is going to have Gnunify 2010 in February. Bangladesh is going to have BASIS SoftExpo 2010 & Fedora-BD get-together in February. Malaysia is going to have FossDay'10 in February. Indonesia is discussing about possibility of attending Gnome Asia. Not sure about the venue. Philippines post healthy growth in number of contributors. This page was last edited on 3 September 2010, at 15:37.